My grandfather’s life started in jeopardy due to his premature birth and small size, which forced him to spend his first two weeks without his family in an incubator. My grandfather, Al Bien, was born in Beijing, China in 1934 where his home was in a “hutong” or alley. Following the beginning of the second Sino-Japanese war, his family moved to Tianjin. Less than a year later were on the move once again, following a flood in Tianjin, this time to Kunming. To get to Kunming they had to go through Shanghai, Hong Kong, and finally Honai before taking a train into Kunming. While his father was exploring petroleum deposits, he stumbled across the first fossil remains of a dinosaur in China. This dinosaur was named “Bienotherium” after my great-grandfather. About two years later, they moved from Kunming to Chongqing by way of a caravan containing two trucks loaded with the family and the bones of the dinosaur. One thing that Al remembers well from Chongqing was the availability of good street food, especially the crystal candy animals. However, it was not all great in Chongqing, with Al and Fred getting fed up with school and ditching until they were ultimately expelled and enrolled in a different school. Additionally, Chongqing was made the capital during the Sino-Japanese war and bombing raids were frequent, making the bomb shelter home for a month. A little while later, they moved to Lanzhou due to the discovery of oil fields. They spent about one year in Lanzhou before moving back to Chongqing for a short while. During this time Al and Fred experienced their first Chinese New Year. They were blown away by the dancers and were thrilled with the red pocket money each of them received. Soon after this, they moved to Shanghai to accompany my great-great-grandfather, who, at the time, was the vice president of the Bank of China. In Shanghai, Al attempted to use his money from Chinese New Year to purchase the delicious street food available in Shanghai, but with the inflation of the yuan, this money was not nearly enough. Following some time in Shanghai, Al was told they were moving to America for better opportunities. In 1946, they boarded a US army transport bound for America. Two weeks later, they passed under the Golden Gate Bridge and then took a train to Bakersfield. They enrolled in summer school, where Al started to learn English during the day and then go to Chinese school, which is where he met my grandmother. His first year in school, Al struggled, which was embarrassing for him. Due to some economic troubles his family then moved to Honolulu without his dad, who moved to Texas to work in the oil fields, where Al’s maternal grandparents lived. In school, Al put in extra effort to learn English and with the help of his teacher, he rapidly grew better. After a year in Hawaii, they had some more money and returned to Bakersfield where they had no trouble rejoining old friends. After learning they were not going to return to China, Al doubled down on learning English and with more help from his teacher was able to learn even faster than before. At the end of eighth grade, he was commended for his incredible progress since sixth grade. He attended high school in Bakersfield where he worked at the grocery store to save up for college. After high school he was able to attend college at UC Berkeley where he majored in electrical engineering. In college he spent a lot of time with my grandmother, as they would carpool together to and from Bakersfield. Later they got married and had four kids. He worked at the National Ordnance Test Station for a few years before moving to Sunnyvale and working at the Stanford Research Institute. Later he started ATAC, a company that did software development work for the Federal Aviation Administration by creating the software for air traffic control stations. In Sunnyvale he and my grandmother raised four kids, including my mother and they still live there today. 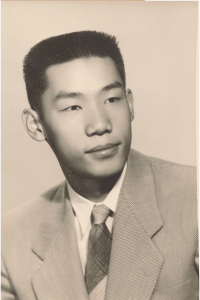 My grandfather has fought his entire life, struggling through constant moving in China along with the wars going on before coming to America as a foreigner. By working hard and learning English he was able to attend college and lead a successful career, creating a company that is still around today. His story goes to show that in America there are opportunities for everyone and that hard work pays off. This story is based on an interview by Nicholas Thom, a student at Palo Alto High School.